The Multiplex 10 Cinemas is back in business! …after a (nearly) twelve year run. The full archives are still available online, so you can read the story in its entirety here! BUT you can also read the first several years—with a bunch of newer material—in the three (so far) print collections! 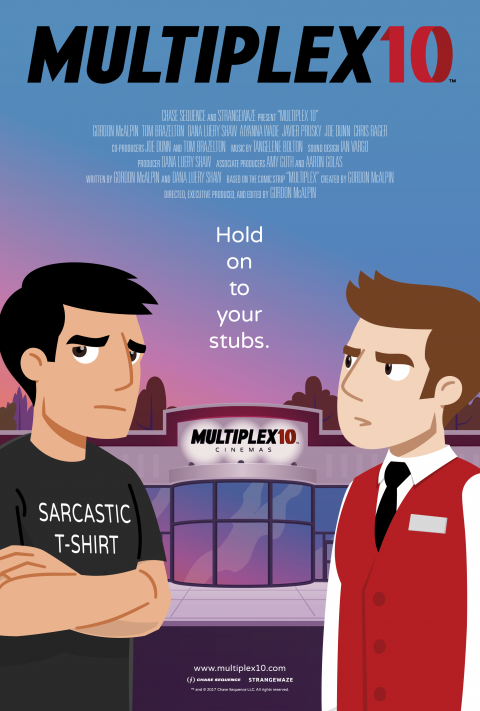 An animated prequel/reboot called Multiplex 10 was funded through Kickstarter in 2017 and is now to stream, rent, or buy on Prime Video and several other platforms! And an all-new Multiplex 10 web series of standalone vignettes/comedy sketches is FREE on the Multiplex 10 Cinemas YouTube channel and the official Multiplex 10 website! You can also stay up to date on my work by subscribing to my newsletter!